Crown your home with the Whitehall Full-Bodied Horse Weathervane. 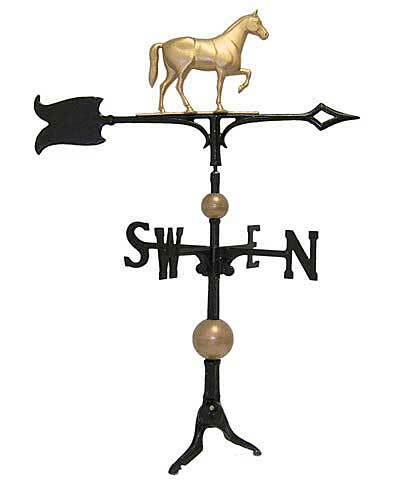 This accent features a 7.5" tall gold colored prancing horse atop a black arrow which, when propelled by a breeze, swivels to denote wind direction. Fixed arms cross to indicate the cardinal directions and two golden spheres rest on the shaft to complete the piece. Attention to detail is evident in the horse's musculature. The heavy duty aluminum construction and durable finish ensure that the weathervane will withstand even the harshest climates, season after season. The included mounting bracket allows you to position this weathervane for easy installation on your rooftop. The Whitehall Full-Bodied Horse Weathervane will add beauty to your home and provide a lifetime of functional enjoyment. Made in the USA.